by Dr. Christopher Chang, last modified on 12/23/18. Treatment truly depends on the actual cause as often, the symptoms of the snotty nose are indistinguishable among the possibilities listed above. Note that sinus infection is not mentioned above. That's because sinus cavities are not fully developed until adolescence. 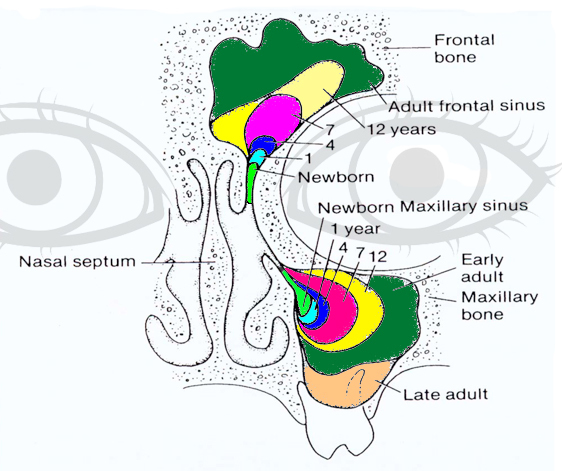 As such, kids less than 7 years do not generally suffer from significant sinusitis. Click here for more information. Regardless of the cause, saline spray or saline bullets to the nose followed by nasal bulb suctioning is highly recommended as often as 4 times or more a day to help alleviate these symptoms. In essence, YOU are blowing the nose for the child. In an adult with nasal congestion, nose-blowing may occur 20 or 30 times a day, so keep in mind doing it once or twice for a child with a snotty nose is inadequate. A word here about nasal bulb suctioning... There are a few things one should keep in mind when looking for a nasal bulb suction to use on your child. • Rounded tip to prevent nasal trauma. • Clear tubing so you can see what you suctioned out (as well as know when it's time to clean it). • Clear snot catcher so you can see what you suctioned out (as well as know when it's time to clean it). Tip not quite as rounded as would be ideal, so be gentle when placing against the nasal opening! 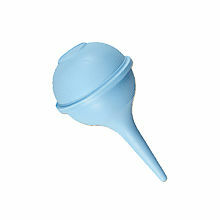 The other downsides are that the suction is not very strong and the device tends to break easily. 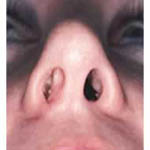 • Tip is pointed which may irritate the nose due to repeated traumatic insertion over time. • Difficult to clean as you can't take it apart increasing risk of infection. SO, what are some of the clues to help determine the actual cause and therefore guide treatment? "Symptoms are all year round and does not seem related to illness or the seasons." Adenoid Hypertrophy is a VERY common cause of this particular problem. Adenoidectomy is curative. 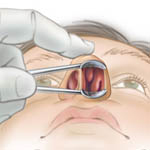 However, risks of bleeding and swelling in the post-operative period is higher in kids less than 3 years of age and therefore is not recommended unless the child is truly suffering. Better to wait. Starting from the age of 2 years old, steroid nasal sprays for at least 3 months is something to try (read the research here and Cochrane review here). Turbinate hypertrophy and deviated septum are other less common causes, both treatable by surgery. Again, better to wait if possible. Rarely, anatomic problems such as choanal atresia may exist. One test to help definitively determine what may be going on is Fiberoptic Nasal Endoscopy. This test is usually done at the time of the initial office visit. "Symptoms occur mainly with fever and copious colored nasal drainage." Most likely due to a viral illness (most common) followed by bacterial super-infection (bacteria super-infection means when a bacterial infection occurs in setting where viral illness is also present). Less common is bacterial infection alone. A viral component is most likely present if symptoms do improve partially with antibiotics followed by immediate recurrence of symptoms after antibiotics completed resulting in repeated courses of antibiotics. In this scenario, it is best to avoid antibiotics unless the child is quite ill as only time will allow for the viral illness to resolve which is the main problem. Conservative care with saline spray to the nose followed by bulb suctioning is recommended. Daily Xlear Nasal Spray may also be helpful. 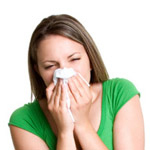 If no fever is present, but drainage is an issue, allergies may be a problem. Also, many of these symptoms often improve markedly after an adenoidectomy. Steroid nasal sprays are also helpful if adenoidectomy is to be avoided (read the research here and Cochrane review here). "Nasal congestion with clear drainage, especially during certain times of the year. Crusty nose is also an issue." Certainly sounds like allergies. Treatment with antihistamines and if older than 2 years, steroid nasal sprays is recommended. 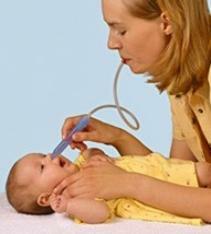 Saline spray followed by nasal bulb suctioning is also quite helpful in this situation. "Nasal congestion with worse drainage when eating as well as nasal air escape sounds while talking." If food or drink comes out the nose while swallowing and / or if you hear air constantly coming out the nose while talking, the child may be suffering from velopharyngeal insufficiency or VPI. This condition is due to the inability of the soft palate to tightly close up against the back wall of the mouth when talking or swallowing. To read more about this condition, click here or instead, watch a video about this condition. In this situation, removing the adenoids almost always makes these symptoms worse. Please contact our office for an appointment! This video segment on the stuffy nose was aired on CBS on 6/5/10. Why Do Babies Hate Getting Their Nose and Face Wiped??? Is 1 Liter of Nasal Fluid Produced a Day Truly Normal? What is Found in Normal Nasal Fluid in a Healthy Human Being? Why Does the Nose Whistle in Some People?